Pastor Eric Willoughby became our senior pastor in May 2013. He and his wife, Brittnee, have a heart to reach the New River Valley. Eric is originally from Amissville, VA and has resided in Blacksburg for eleven years. The couple has been married for eight years and have three boys- Caleb (5), Malachi (4), Josiah (1.5) and a baby girl due this summer. Pastor Eric graduated from Virginia Tech in 2010 with a B.S. in Civil Engineering. He was on staff with Tried Stone Christian Center for two years serving as youth pastor and interim pastor until April 2013. Brittnee was on staff with Chi Alpha Campus Ministries at Virginia Tech for four years and transitioned over to working at the church starting in the fall of 2013. She stays at home with her boys full time now and serves alongside Eric at Tried Stone. Brittnee has a heart to reach, teach, and equip women for the kingdom of God-walking fully in the confidence and giftings God has given each of us. Eric and Brittnee have a heart for the New River Valley and a passion for reaching the community and the world, locally and globally. 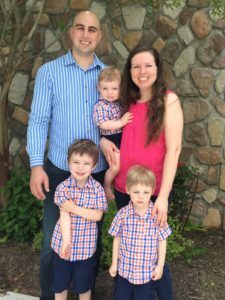 They desire to see Tried Stone grow through evangelism, to reach families, singles and college students at Virginia Tech and all of the New River Valley. To contact Pastor Eric email pastoreric@triedstone.cc.